To think back on my life before Helldriver I have some hard realizations to come to terms with. 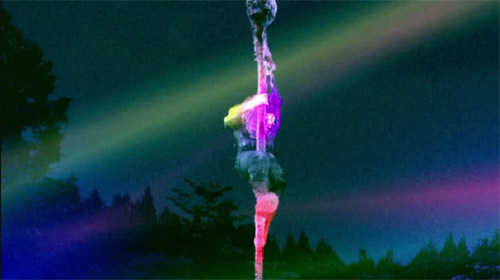 For example, before Helldriver I’d never seen a woman use a zombie’s spine like a stripper poll. I’d also never seen a car made entirely of zombies, be driven by another zombie but I’m getting ahead of myself. 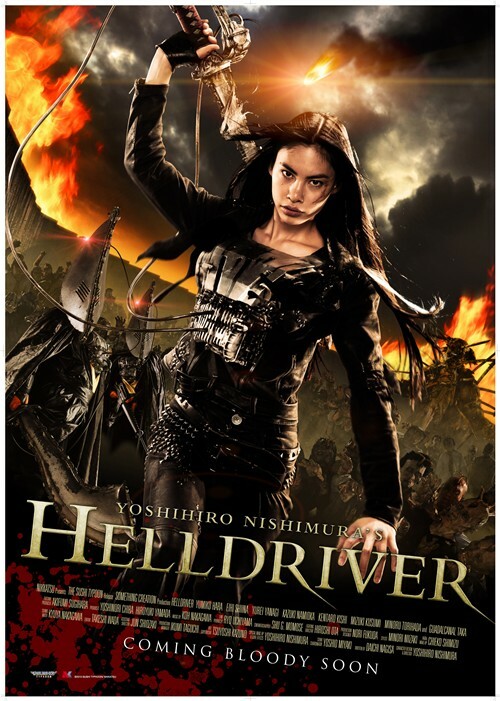 Helldriver was released by the good folks at Sushi Typhoon and was directed by Yoshihiro Nishimura. Nishimura, of course a longstanding figure in Japanese splatter flicks having worked on The Machine Girl and Tokyo Gore Police to name a few. The movie probably has one of the longest pre-titles I’ve ever seen. It felt like I was already twenty minutes into the thing before the title flashed across the screen but it does give the skinny on the plot. Six million citizens in Japan have become infected with a mysterious alien ash. This ash causes them to look and behave much like zombies, except for some volatile tumour on their heads. In an attempt to save as many people as they can the Japanese government builds a wall separating the north and south of Japan. There are a great many normal citizens (including the Prime Minister) who believes that these zombies shouldn’t be killed but rather cured. She and a small group of others travel deep into the zombie’s territory to attempt to kill the queen and end the nightmare. Along the way they are barraged by hundreds of flying heads, a pregnant zombie that uses her zombie baby attached to an umbilical cord like some kind of medieval flail. The stuff they come up with is just a mind boggling. Helldriver thankfully feels closer to Tokyo Gore Police than anything else and that’s a good thing. It does have the typical “Sushi Typhoon standbys” Lots of awkward dance scenes with some dodgy CGI and long close-ups of people jamming disgusting things in their mouths which at this point seems like they do it just because they feel they have to. Strangely all of my complaints about the film were before the main story kicks off. When it gets into the meat of the action the film really starts to work. Special effects are what these movies are really all about and I can tell they really kicked it up a notch especially with the whole look of The Zombie Queen. Throughout the movie there are a lot of really nice looking effects but only when they stick to the practical stuff. Nishimura has this obsession with wriggling tendons and merging body parts together so his monsters always resemble some horrific modern art piece. The CGI is -and probably always will be -the biggest weakness for this production company. It has a lot to do with their limited budget and the fact that they keep coming up with crazier and crazier things. Helldriver is no exception, the CGI looks incredibly synthetic and I’ve always found that to be a personal pet peeve of mine in any movie. To be honest I’ve not enjoyed a lot of the stuff that’s come out of Sushi Typhoon lately. The stuff they’ve released was alright but there was something about their earlier films that I just liked more. I was generally disappointed with films like Robo-Geisha. Mutant Girl Squad and Vampire Girl Vs. Frankenstein Girl. They were too silly and chaotic and I couldn’t really say they were worth the price of the DVD but I feel this is probably the best they’ve released in awhile and I did actually find myself really enjoying it by the end. If you get a chance I’d say check it out. It’s a non-stop gore fueled comedy that just begs to be watched with a group of people. 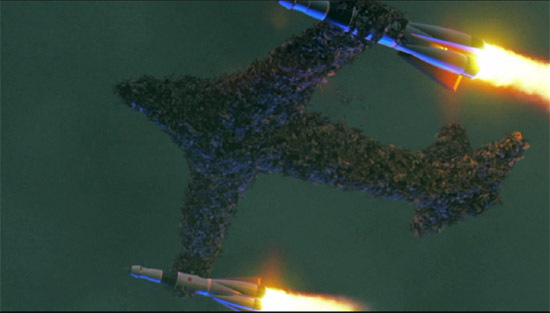 This is a horde of zombies in the shape of a plane holding two rockets.